The aim of Heara (comment) events (multidisciplinary events for contemporary art) and (H)Earat Shulaym – Journal for Contemporary Art is to meet new trends on art, artists and public, through the creation of new ways of art exhibition and creation from those that the artistic mainstream institutions propose. The development of this independent work in Jerusalem is a step of the process of deconstructing the centralist Israeli Art map and in the creation of new centers that are independent from the traditional art centers and institutions. In these two projects more than 400 artists took part and more than 400 art works were shown and published. In Heara events a way of collaboration and cooperation between artists was found and among them and different social and cultural institutions in the city, which had open the doors to these type of artistic action, in a dialogical and mutual respect. In this way new possibilities and ways of exhibition were created to the local art community. Heara events and (H)Earat Shulaym – Journal for Contemporary Art closed the first two years of artistic action, independent from the main artistic institutions and commercial sponsors. The events and the journal are non-profitable. They are organized without any official or commercial support. Heara events are organized by sala-manca group in occasion of the publication of each new issue of (H)Earat Shulaym. אמנים מתחומים שונים מגיבים לבית החולים למצורעים לשעבר בירושלים, מתערבים בו ומעירים עליו. האירוע ההיסטורי והחד-פעמי, שבו משתתפים יותר מ-50 אמנים, הוא מחווה לסדרת האירועים וכתב העת שעוררו מחדש את סצנת האמנות בירושלים בעשור הראשון של שנות האלפיים. האירוע מאורגן לרגל השקת ספר בן 300 עמודים ובו תיעוד ומאמרים חדשים על אירועי האמנות "הערה" ועל כתב העת "הערת שוליים" ולרגל השקת הפרויקט החדש מבית מעמותה: "האקדמיה של העכשווי" (The Underground Academy). 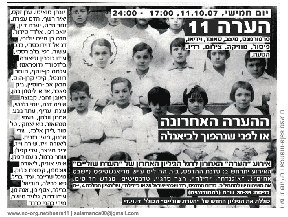 בשבת 7 ביוני יתקיים בבית החולים למצורעים לשעבר "Jesus Hilfe" (בית הנסן) אירוע אמנות עצמאי שיימשך יום אחד בלבד (!) 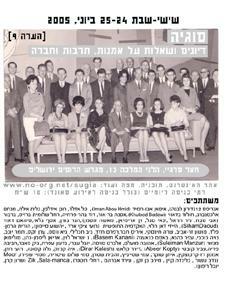 בהשתתפותם של יותר מ-50 אמנים מתחומים שונים (פרפורמנס, וידיאו, מיצב, מיצג, מוזיקה, אמנות סאונד, צילום וכו') אשר יציגו ביותר מ-1,500 מטר בחללי בית החולים לשעבר. באירוע יוצגו עבודות חדשות שנוצרו לרגל האירוע ועוסקות בשני נושאים מרכזיים: בית החולים "Jesus Hilfe" (בית המצורעים לשעבר ובית הנסן היום) על מגוון היבטיו ההיסטוריים, הסוציולוגיים, הפוליטיים והאדריכליים; אירועי "הערה" וכתב העת "הערת שוליים" לאמנות עכשווית, שעיצבו, חידשו ואתגרו את הדרכים שבהן ניתן לקיים עשייה אמנותית באחת הערים הטעונות בעולם, מתוך התייחסות להיסטוריה ולהווה שלה ולמבניה האיקוניים, ויצרו קהילה אמנותית פורה בירושלים ומחוץ לה. באירוע יושק הספר "*הערה" (כ-300 עמודים, צבע) בעריכתם של רונן אידלמן וקבוצת סלה-מנקה. הספר בוחן ומסכם את אחת התופעות המרכזיות שהתרחשו בירושלים מאז שנת 2000 לטענת אמנים, אוצרים ומבקרי אמנות רבים לאורך השנים. 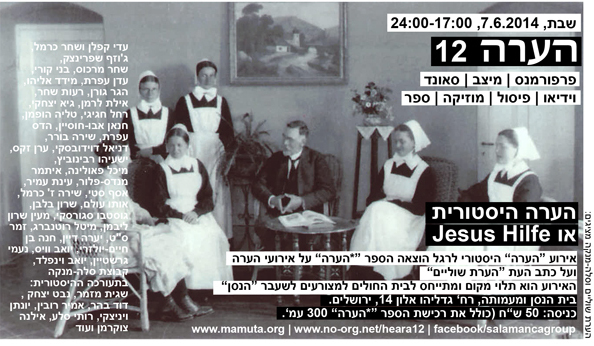 The Hansen Compound was built by the Protestant community in Jerusalem in 1887 as a leprosy asylum. Planned by Conrad Schick, a member of the protestant community and one of the prominent architects working in Jerusalem in the 19th century, it has served its original purpose for over a century. The issues with which “Last Comment or Before We Turn Into a Biennale” deals are: Utopia, in its different aspects such as “no-where”, “perfect place”, “perfect society”; walking and transit areas. We will deal with these areas not only as separation but also as points of encounter between different groups of society – Haredi, Secular, Muslims, Jews and Christians. Each issue will receive a different character expressed by works in the various locations of the event. 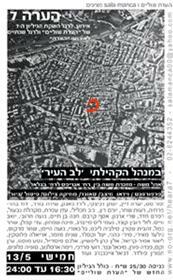 “He’ara 11” will take place in Jerusalem in the areas of the Russian Compound and Ha-Nevi’im Street at four different locations. הנושאים בהם תעסוק ה"הערה האחרונה או לפני שנהפוך לבינאלה" הם: אוטופיה, על מובניה השונים, כגון "שום מקום", "מקום מושלם", "חברה מושלמת"; הליכה ואיזורי מעבר. נעסוק באיזורים אלה לא רק כהפרדה אלא גם כאתרי מפגש בין קבוצות אוכלוסיה שונות – חרידים, חילונים, מוסלמים, יהודים ונוצרים. כל נושא יקבל פן אחר בביטוי של העבודות באתרים השונים של האירוע. On February 16th, the Jerusalem based artists group sala-manca will celebrate 4 years of the independent art activities of "Hearat Shulaym". For the occasion a big art event will be held, in which more than 60 artists will take part and 3 new magazines for art and culture shall be launched. 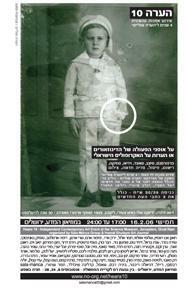 "Heara 10" will take place in all the spaces of the Science Museum of Jerusalem. The art works intervene with the spaces and also with the permanent exhibition of the museum. More than 40 works and performances will be presented, made by more than 60 artists, who have created new works in the fields of video, sound, music, new media, performance and installation. .באירוע "הערה 10 - על אופני הפעולה של הדינוזאורים או הערות על האקרופוליס הישראלי" שיתארח במוזיאון המדע בירושלים הוזמנו מעל 60 אמנים ליצור עבודות המתערבות במוזיאון, בתצוגותיו ובחלליו השונים (אלו המשמשים לתצוגות ואלו שלא). נושא ההתייחסות הוא "האקרופוליס הישראלי" – גבעת השלטון בגבעת רם. Sugia, is a platform for meeting and discussion of practical questions and actual problems regarding art, new media, politics and society.The event is also an attempt for mapping, meeting and sharing artistic practices between groups and individuals who are active locally.We intend to create a dialogical and open meeting and invite artists, collectives, researchers, cultural actives and all that are interested in taking part in the initiative to send proposals for panels, lectures, projects and workshops regarding the subjects defined below, and also to send works or texts to archives that will be created in accordance to these subjects and will be available for the public. סוגיה הוא אירוע עצמאי המציע מפגש בין אמנים, פעילי תרבות, חוקרים והקהל הרחב. במהלך שני ימי האירוע יתקיימו דיונים, הרצאות והצגות של פרויקטים – כולם סביב יחסי הגומלין בין אמנות, תרבות, מדיה חדשה, פוליטיקה וחברה. מטרות המפגש הן למפות פרקטיקות אמנותיות של קבוצות ופרטים הפועלים בארץ ולהפגיש ביניהן, על מנת לפתוח ערוצים לדיאלוג, שיתוף פעולה והרחבת הפעילות העצמאית. 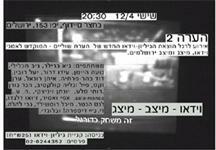 The event is an invitation to comment artistically on two central institutions in modern society in general, and in Israeli society in particular. Through these institutions society channels knowledge, values and messages which give form to the character of the individual and thus give form to society itself. 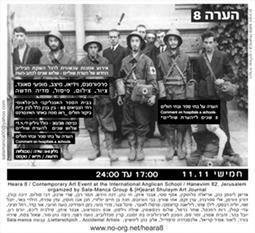 Heara 7 is the result of the encounter between contemporary artists (guests) and the Community Center "Lev Hair", its sorroundings (Nachlaot neighbourhood, Mahane Yehuda Market) and its inhabitants. The works deal with the concept of comunity (cultural, ethnic, social, national and artistic comunity), and a Jerusalem urban center. Heara 6 deals with one of the central symbols of Jerusalem and its implications and meanings in the Jerusalem of our days. Sergey Courtyard itself and the hostel building, its geographical location in the city- an island of noble beauty and silence in the city center, in front of the Today Jerusalem Jail in the Russian Compound, the building’s and area’s history, the present use of as well as today political situation, were the themes of the Event and of the works. More than 60 artists from different art fields were invited to create site and time specific works, which made a unique dialogue with the building, its history and the permanent exhibition of the Old Prison of Jerusalem in the Russian Compound. Event devoted to sound art and its contemporary tendencies in the fields of performance poetry, sound works, dj, hip-hop performance, experimental digital music, installations and video works. This event was devoted to Jerusalem artists who work in the fields of video, performance, installation, photography, sound and sculpture. More than 20 artists presented new works, which proved to be an artistic reaction and comment to the hard and complex times that reign in the Middle East.